The GR-50 grapple is for large farm tractor forwarders, backhoes, skid steer loaders and mini excavators. Modern bypass grapple design. 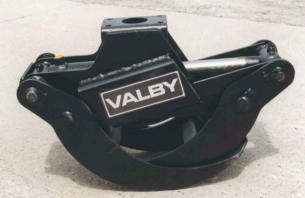 All Valby grapples have a bronze bushing at every joint, and every joint has a grease fitting. Large, powerful cylinder. Double connection rods provide good balance and less stress. A belly plate protects the cylinder from underneath. 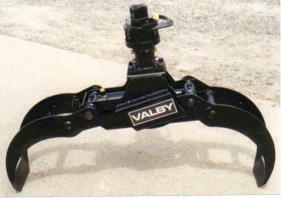 The Valby bypass grapples have excellent geometry. The form of the claws enables a smooth roll in of the stems. The grapples also close to a tight minimum opening.